Fast Action Sale $149 - Add to Cart Now and Take $20 off with this promo code: CPJS20 - Hurry, offer expires ! Upload the video to YouTube. 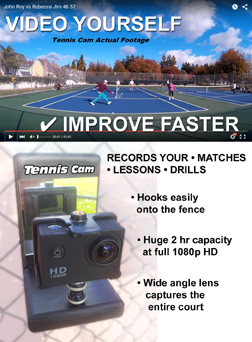 Record your Tennis Matches and Improve your Game. Review your strategy, shot placement, stroke mechanics Takes gorgeous high definition 1080p HD footage Hooks easily onto the fence at eye level. No pole or ladder needed. Mirror lets you frame the court perfectly Super wide angle lens captures the entire court Battery life: 2.5 hour video capacity at full 1080p HD. Includes 16 GB micro SD memory card for 2hrs at 1080p, 5hrs at 720p The #1 reason why you don't improve : You don't keep track. You don't keep track of mistakes you make, nor do you keep track of good shots you make. Make your valuable playing time count. Experience is the best teacher. Take note of patterns of play that generate points, Analyze your stroke, Even watch for your opponent's good shots and copy them.